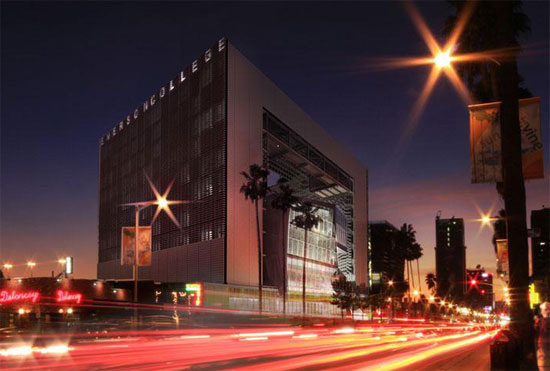 Emerson College has announced that Saturday night’s sold out gala to celebrate the opening of Emerson College Los Angeles will be live streamed starting at 8 pm PST/11 pm EST via the College’s website. (LOS ANGELES, CA) A week-long series of events—starting with a ticketed gala on Saturday, March 8—will celebrate the grand opening of Emerson Los Angeles (ELA), a spectacular new academic and residential facility that will enable the College to significantly expand its contribution to the city and to the entertainment and communication industries. Board, led by Patricia Peyton Martell ’84. significant addition to the Hollywood skyline. a planned green screen motion capture stage. community. Community service will be a big part of the new ELA,” Bright said. management infrastructure to monitor overall building efficiency. about these events, visit emerson.edu/ela. 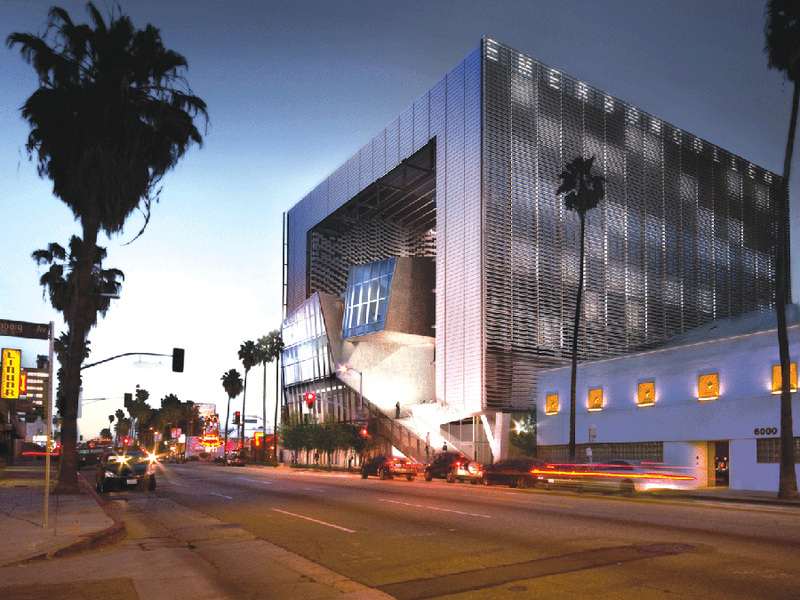 The excitement is mounting throughout the Emerson community and the City of Los Angeles as the College’s stunning new facility prepares to open its doors in January 2014. 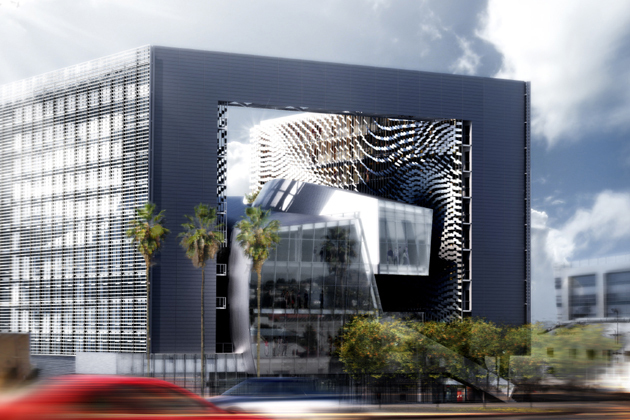 Located in the heart of Hollywood at 5960 West Sunset Boulevard, Emerson College Los Angeles will represent the realization of a dream. The College will now have a permanent West Coast presence that will offer a dynamic curriculum to students and will be a gathering place for industry leaders, neighborhood associations, and alumni. 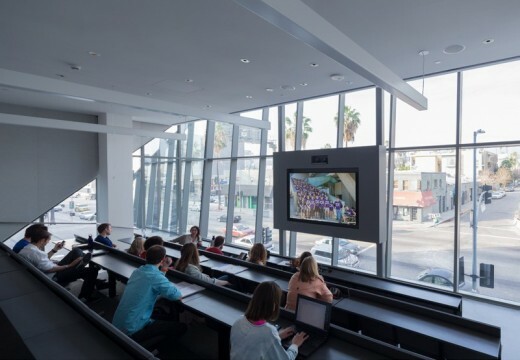 Students move into the new Emerson College Los Angeles in Hollywood in early January 2014, where they’ll find state-of-the-art spaces with cutting-edge technology for everything from theater practice to audio and visual production and live video lectures. Students will even order food from the center’s café using a smartphone app. 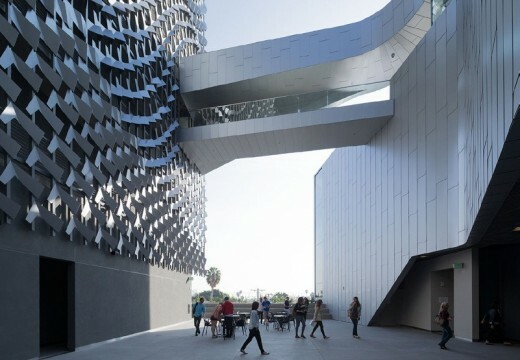 Designed by Pritzker Prize–winning architect Thom Mayne, this Los Angeles facility will house approximately 220 students, as well as residence hall staff and several visiting faculty in more than 100,000 sqft of state-of-the-art classroom facilities, production and performance studios, outdoor event spaces, a Dolby 7.1 Surround Sound audio post-production suite, and much more. The college (from Boston, MA) have constructed a 10-story building designed by the celebrated architect Thom Mayne’s architecture studio, Morphosis, on a vacant lot at Sunset Boulevard and Gordon Street. The building, reported to cost around $85-million, will house around 224 students in addition to providing academic facilities and ground-floor retail space. The student rooms would be located in the ‘frame’ – akin to the vertical elements of La Grande Arche de La Defense in Paris – two towers that would support a crosspiece to create an open square. Inside would rise a glass pavilion housing the academic facilities. 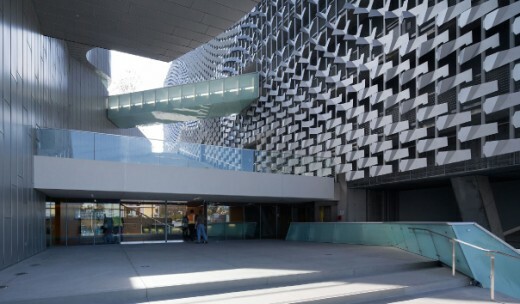 This academic building follows another US education building by Morphosis for Cooper Union in New York.